Ceramicists: Blanchard & Co., John Marriot Blashfield and Salviati Burke and Co. The central entrance of the Institute has a colourfully tiled tympanum and three profile portrait medallions, of Bentley, Flaxman, and Priestley, surmounted by a statue of Josiah Wedgwood. 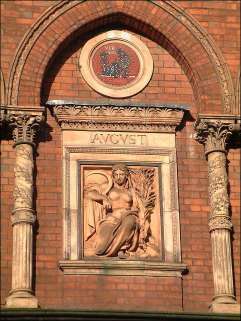 Around the first storey of the building is a decorative frieze which incorporates the monograms of those involved with the founding of the Institute. The window mouldings and terminals on the first storey use foliate designs with animals hidden among the leaves. The top of the upper façade is surmounted by a pierced quatrefoil cresting. 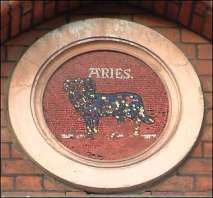 On the upper storey a series of twelve terracotta panels set in arcading illustrate the months of the year, and above them mosaic signs of the zodiac. Between the storeys are ten relief terracotta panels which depict the processes involved in the manufacture of pottery. The process panels depict crowded scenes in pottery workshops. The panels representing the months are deep reliefs of male and female Classically draped figures. The January panel depicts a mother and child,; June a man shearing a sheep; July a man sharpening a scythe; November is an old woman and December an old men. Josiah Wedgwood I (1730-1795) was born in Burslem, now one of the six towns of 'the Potteries' or Stoke-on-Trent, Staffordshire. After completing an apprenticeship he opened a successful manufactory in Burslem in 1759, and in 1769 another one near Hanley, which he called 'Etruria' in the incorrect belief that Greek vases were Etrusacan in origin. Etruria included a model factory, workers village and mansion. A relief in Stoke Church by John Flaxman (1755-1826) records that he, 'converted a rude and inconsiderable Manufactory into an elegant Art and An important part of the National Commerce'. 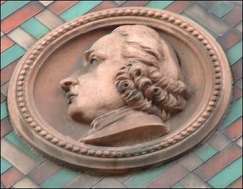 The other portraits on the entrance of the Wedgwood Institute are of John Flaxman (1755-1826), the sculptor and Wedgwood modeller, Joseph Priestley (1733-1804) the scientist and inventor who discovered oxygen, and Thomas Bentley (1730-1780) a business partner of Wedgwood from 1768 until his death. The idea to combine the need for a Burslem School of Art and the desire to provide a permanent memorial to Josiah Wedgwood was first proposed at a Public Meeting on 24 January 1859 by Joseph Walker, who had been a student at the former Burslem School of Design. Upon the purchase of a plot of land in 1860, the Building Committee was formed and an architectural competition held for designs for the Institute. Despite prizes being awarded, neither the first or second prize designs were thought suitable. A second competition was arranged and the design of George Benjamin Nichols was selected. When applying for funding the Committee had consulted with the designer Henry Cole (1808-1882) and the architect Francis Fowke (1823-1865), both of the Department of Science and Art at South Kensington (now the Victoria and Albert Museum). This was the beginning of a long term involvement with the Institute building by the South Kensington Museum. However due to a poor local economy in Staffordshire the next stage of building the Institute did not take place for nearly three years. 'The manufacturers had developed ceramic art to a very wonderful extent: vases, statuettes, and the like were produced in the Potteries with a perfection which made Europe aghast and envious, but there was another more solid and more eternal sort of pottery he should like to see taken up in this district and that was architectural pottery'. He then went on to tell the local potters about the beautiful mouldings in terracotta on the hospital in Milan, and the specimens of Della Robbia in the South Kensington Museum. After referring to the hardwearing qualities of terracotta, he went on to say that there was surely a strong case for using terracotta for the decoration of the façade of a building dedicated to the memory of a great potter. He suggested another competition to design a decorative façade upon Nichols' original architectural design, offering a prize of £25 for the best coloured sketch. The designs were to be in ceramic materials and were to be structural as opposed to purely decorative. Hope intended that the building should demonstrate the qualities of ceramics and act as promotion of the material. Due to worries over accelerating costs the Committee stated that they were not bound to carry out the winning entry. Edgar and Kipling therefore submitted a second design to the judges, Beresford Hope and Sir Matthew Digby Wyatt, which received their approval. Their designs for the upper storey included the series of 'month' panels with moulded frames, the zodiac mosaics, and the panels between the two storeys depicting pottery manufacture. However, there are two major differences between it and the design as executed. The panels showing the process of pottery manufacture were originally to be coloured, as in Della Robbia ware, and the spaces within the arched windows on the ground floor to contain circular plaques of eminent potters of ancient and modern times. In the event, only three small medallion portraits of Bentley, Flaxman and Priestley were produced for the frieze over the porch. The statue of Josiah Wedgwood was not added until 1873. Kipling left England for India soon after winning the competition, which left Edgar to take much of the credit for their designs. On 26 October 1863 The Rt. Hon. William . E. Gladstone MP, Her Majesty's Chancellor of the Exchequer(1809-1898) laid the foundation stone of the Institute. The ceremony was accompanied by a banquet held at Burslem Town Hall. The principle speaker was the Rt. Hon. Earl of Granville KG, President of the Building Committee. The expense of the façade remained a major problem, particularly in view of a contemporary recession in the Potteries. At one stage, the Committee almost decided to shelve the whole project, but Beresford Hope was determined that the façade should be created and suggested they approached Henry Cole for assistance. 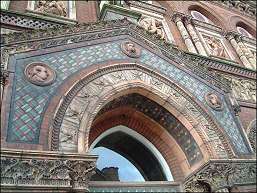 In 1864 Cole offered the facilities at the South Kensington Museum Department of Science and Art for the construction of the terracotta panels, his offer included provision of most of the wages for the modellers. The Committee decided that the modellers should come from the Potteries Schools of Art and should preferably be from Burslem. Rowland James Morris and William Wright arrived in South Kensington in May 1865, at Morris' request for help to keep up with the large amount of work, they were joined by J.F. Marsh at the end of 1866. It seems that Morris had much of the control over the design of the 'month' panels, he also modelled the statue of Wedgwood, the 'process' panels were designed by Matthew Elden, a member of the Department of Science and Art. The 'month' panels, statue, and many of the smaller decorative features were fired by Blanchard & Co. of Blackfriars, the 'process' panels were fired by Blashfield of Stamford. Signor Salviati executed the zodiac mosaics. The amount of people involved in the work has led to some confusion in sources such as Pevsner and the Victoria County History over who exactly was responsible for the works. Further confusion is added by the fact that different panels bear different names: Blashfield's, Morris' and Elden's names appear on different panels. The building was officially opened on 23rd April 1869 by the Earl de Grey and Ripon, the Lord President of the Privy Council. However the terracotta work was not completed until September 1872. The statue was finally unveiled by Sir Smith Child MP. The newly finished institute incorporated a School of Art and Science and a Free Library. 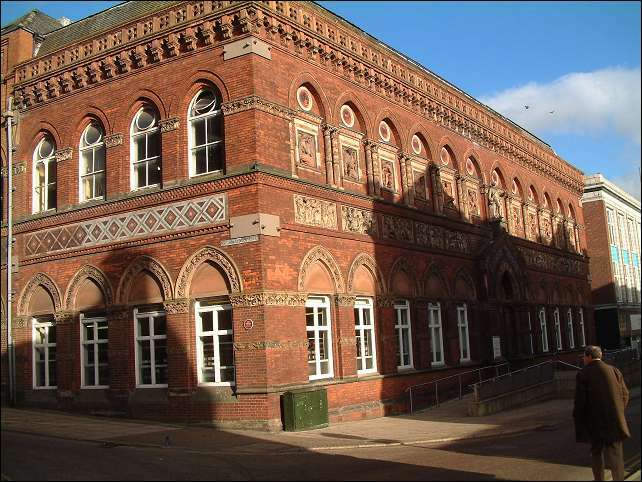 The Wedgwood Institute is currently a library and is currently undergoing a feasibility study with the intention being to turn it into a combination of Library, Arts Centre, and retail outlet. In their sketch, the spandrels of the arch of the porch contained seated figures of Art and Science in mosaic on a gold ground. The porch was surmounted by a frieze, with three circles occupying its centre and ends. These were filled with medallions in Jasper ware depicting three antique forms in pottery - The Egyptian, Greek and Roman. In the circles in the heads of the ground floor windows were painted medallion portraits of the most celebrated potters. Over the ground floor a frieze ran along the length of the façade, marked with circular panels in red terracotta, filled with different animals. The most significant difference was that on the first floor the tympanum in the head of each of eight windows was filled with alternate devices in majolica ware - a laurel with the monogram of Wedgwood, and the Burslem Arms. In the central portion over the porch was a large medallion portrait of Wedgwood after Joshua Reynolds' portrait in the head of a coupled arrangement of two large windows. Above this storey, in panels over each window, were eight relief panels showing processes in the manufacture of pottery - clay digging, coal mining, colour making, throwing, turning, moulding, firing and painting. Between these subjects was a seated allegorical figure in pale terracotta symbolising the different nations famous in the history of ceramic art. The figures were carried on large pilasters dividing the windows, enclosed in a niche, and covered with canopies.